What matters most to you in an outdoor space? What do you plan to use your deck for? How much time and effort do you have to maintain your outdoor space? All of these questions and more are important considerations when you are planning your dream deck. For every question, there are several options to consider, and the selection process might seem overwhelming at first, but all you need is inspiration and an expert guide from Ferris Home Improvements to help you jump start your journey to achieving your dream deck. Our staff of experts is here to help you design and achieve an outdoor living space that is not just beautiful, but customized for your lifestyle. Below are some examples of custom deck projects that we offer our customers for their home or business. Don’t see your specific project? No problem. We’re here to help you with your specific need. Call us today to schedule an appointment to discuss your project! 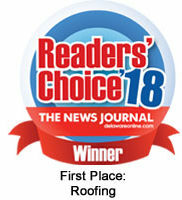 Customers voted Ferris Home Improvements as the Readers’ Choice 1st Place Winner for Best Home Customers voted Ferris Home Improvements as the Readers Choice Winner Home Improvement 2018 Readers’ Choice 1st Place Winner for Best Home Improvement Company and Best Roofing Company in Delaware 7 years in a row, and our experience, craftsmanship, and unparalleled customer service is exactly what has won us these accolades as the area’s BEST in home improvements. We’ve also won numerous other accolades year after year for our excellent customer service and quality craftsmanship. 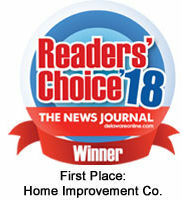 Ferris Home Improvements is a fan favorite because we deliver top-notch home improvements for an affordable price. You know that when we’re on the job, your home, needs, neighbors, and project will be handled with care. Our happy customers are our best billboards, and we are proud to say 60% of our business is consistently generated from referrals year after year after year. Come see what all the talk is about and team up with Ferris Home Improvements to give your home the boost in form, function, and value that it needs! How much are you prepared to spend on your new deck project? Depending upon your budget, the next two factors, size and material, can be adjusted to work within your spending limit accordingly. If you’re not sure whether or not it is time for a new deck, ask our experts and read our Is It Time For A New Deck? page. One thing is for sure—once you establish your budget, then our experts can help you select the deck and accessories that will maximize your budget. Don’t forget also—we offer extremely competitive financing packages for qualified customers who don’t want to pay for the whole deck installation project right away. Our Ferris Home Improvements Wilmington DE deck installation company is more affordable than the competition because we are not part of a giant, franchised corporation. With less overhead and a mid-size crew of dedicated experts in the field, we are a much more efficient company who can offer you better labor pricing for the same top quality craftsmanship you get from the highest bidding competitors.